Once a property has been placed into a conservation easement, the holding organization assumes significant responsibility to ensure that the conservation values of the property are protected and carefully managed in perpetuity. As trustees of an easement, the Hill Country Land Trust is required by law to conduct annual monitoring visits of each property. Monitoring visits are conducted by Hill Country Land Trust staff, and at least one board member. During the visit, the landowner will answer a simple questionnaire about current conditions, activities or projects on the land, and the intentions of the owner to exercise any reserved rights. Trustees will then tour the property with the owner to learn more about the property and the interests of the owner. These annual visits also provide us a wonderful opportunity to consult with landowners on any number of land management issues. We provide landowners with a Stewardship Plan designed to meet their goals in ways that are practical and realistic, and may include advice on seed mixes, equipment, techniques, and other information. Often we find good suggestions coming from other landowners, and during these annual monitoring visits we like to connect people working on similar management challenges. Other ways we support our landowners is by providing workshops, field days, regular articles on land stewardship, and an educational video series. 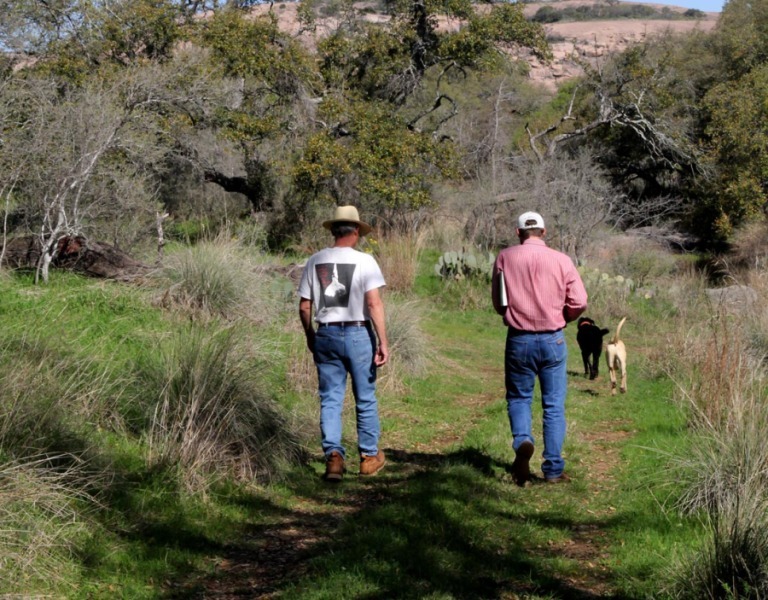 The Hill Country Land Trust is committed to helping all landowners achieve their goal of good land stewardship through best management practices. In a state like Texas where 97% of land is privately held, the only way we can have measureable effect in improving water catchment areas, enriching habitats, and preserving fragile landscapes is by sharing information and working together. If you have a land management question, please fill out form below. We are interested in helping everyone with these questions.